"Please lend me your powers just one more time. I... I'm going to summon the Dragon God." Akane sets forth into the final battle in hopes of putting an end to the long struggle, the resolve to summon the Dragon God firm in her heart. Can her actions restore peace to the capital? And where will her heart lie at the battle's end? 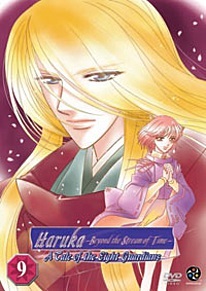 DVD Features: 8-page Booklet, Next Episode Trailers, "The Romance of the Eight Guardians" (Multiple Romance Endings).